Offering a wide spectrum of PLC & Process Control Instruments such as Programmable Timers, Counters (Preset or Universal), Temperature Controller, Micro Programmable Controller, Nano Programmable Controller, Scanners, Hot-Runner-Controller, etc. Temperature indicator and its calibration. Temperature transmitter and its calibration. Temperature sensors such as mercury in glass thermometer, bimetal dial thermometer thermistor and thermocouple. Bare elements of Thermistor, Thermocouple to visualize actual elements. The PLC unit can be interfaced with computer through serial communication for software programming. It can also be operated in simulation mode to develop and study different ladder logic. The setup is tabletop mounted with in built control module. Edutek are offering Multiprocess Trainer Equipments.These units along with necessary piping are mounted on stand-alone type structure. The set up is connected to computer through USB port for monitoring and control by using PID logics. The setup is designed to understand the advanced control methods used for complex processes in the industries. Different experiments like Flow, level, cascade, feed forward and ratio control can be configured and studied with the setup. 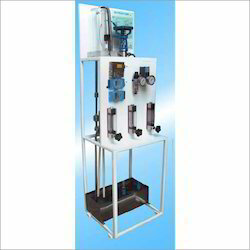 It consists of water supply tank, pump, level transmitter, transparent level tank, orifice meters with differential pressure transmitters, rotameters, pneumatic control valve, I/P converter and serial based dual loop controller. Edutek Instrumentation are offering Interacting And Non Interacting system.The observed step response of the tank level in different mode can be compared with mathematically predicted response. 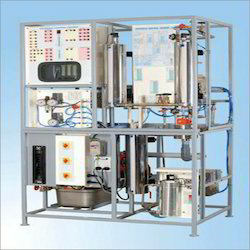 Setup consists of supply tank, pump for water circulation, rotameter for flow measurement, transparent tanks with graduated scales, which can be connected, in interacting and non-interacting mode. The components are assembled on frame to form tabletop mounting. The set up is designed to study dynamic response of single and multi capacity processes when connected in interacting and non-interacting mode. It is combined to study. Single capacity process, Non-interacting process and Interacting process. Dynamics study for Step response. Single capacity Tank, Interacting mode Non Interacting mode. Step response of single capacity system. 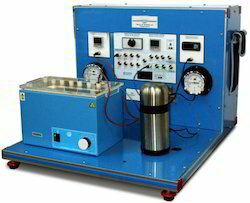 To demonstrate wide range of experiments, applications and advanced control techniques using industry standard instrumentation and controls. Facility to introduce external controller. Inbuilt compressor and plunger pump with VFD. Study of I/P, DPT, control valve, valve positioner. Study of rotameter, orificemeter, venturimeter. Temperature, flow, level, pressure control. On-off, P, PI, PID control, PLC control. Open loop tuning by process reaction curve. Closed loop tuning by Zigler Nicholas method. Staility analysis by Bode plot. Cascade, Feed-forward and Ratio control. Three element control and interactive control. We offer our clients an optimum quality range of Pressure Control Trainer which is designed using the best grade components and latest technology in accordance with the set industry standards quality. 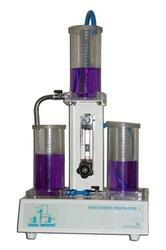 The Pressure control trainer is designed for understanding the basic principles of pressure control. The process set up consists of pressure vessel fitted with pneumatic control valve. Pressure transmitter is used for pressure sensing. The process parameter Pressure is controlled by microprocessor based digital indicating controller which manipulates pneumatic control valve fitted at outlet of pressure tank outlet through IP converter. These units along with necessary piping are supported in a well-designed housing and are fixed on base plate.